Can our dreams help us predict our future? Can they provide answers to our questions or anxieties about love, health, relationships, money, or career? Renown dream interpreter, clinical psychologist, & author Dr. Carl Patrasso Psy.D., M.A. 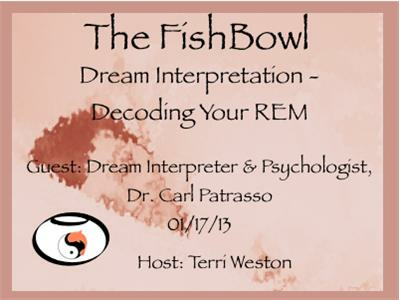 joins Terri Weston to provide practical guidance into capturing the innate knowledge provided through our dreams. Learn * unusual facts about dreams * how to train yourself to access and recall your dreams * how to interpret these messages from your personal dream dictionary * how to tangibly apply these messages and insights to overcome your fears and break through the obstacles in your life. For more info, visit www.intothefishbowl.com.